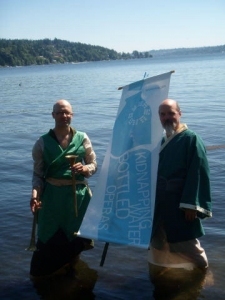 Today is the first run-out for Kidnapping Water: Bottled Operas. We start at Bothell Landing where the Sammamish River winds past mobile homes, under a foot bridge and through a park. When videographer Eric Rockey, percussionist James Whetzel and I arrive, we meet UW Bothell staff and faculty Lisa, Michelle and Bruce as well as researcher/writer Erica Howard. For the first Bottled Opera, No. 46 : Growing, David starts under the bridge and James plays a wood bowl he picked up at Value Village for $2. Nearly half the world's population (2.1 billion people) live on less than $2 a day. This bowl is one of James' prized instruments for the way it resounds in the water and beyond. My impressions of the morning in Bothell Landing include a parade of mom's with baby strollers, the geese that line up when David sang No. 15 : Line Up and a jackhammer that breaks through earth a few blocks away with a flute that plays in the distance. David and James also perform No. 2 : I Am Felled at Bothell Landing. The UW Bothell wetlands are summer dry underneath the boardwalk, so UW Bothell facility staff gather water from the wetlands and put it in a trough for James and David to perform No. 36 : Plish. This work, with libretto by Bret Fetzer, is about a murderous man deranged by his neighbor's sprinkler. The audience of Professor Amy Lambert's class Engaging Visual Arts: Social and Political Issues in Contemporary Art, faculty and staff politely listen. Writer Loreen Lee also meets us in Bothell. After UW Bothell, we perform Bottled Opera No. 24 : Coming Home, libretto by Eugenie Chan, in the water under a willow tree. Afterwards, we go to Lake Forest Park Town Center for lunch. I am excited that there is a King County Library branch in the same building as Third Place Books and a food court. After lunch Eric, David, James, and I go to north Lake Washington where David and James perform No. 07 : Hello Helicopter. Rather than run away, three teenage girls are intrigued and ask us about the singing and playing water. The audiences today are all appreciative. After Lake Forest Park we go to Echo Lake in Shoreline and performed No. 19 : Bottle Upon Bottle in a lake filled with swimming children. When David sings "laughter of children," on cue the children splash and giggle. David also performed an encore of Hello Helicopter here. as we walk away one boy sadly yells, "They're leaving." The final Bottled Opera of today is No. 11 : Heaven, with libretto by Caroline Murphy. David and James perform at Richmond Beach on Puget Sound. Heaven is about a man justifying his drug addiction in the bathroom of an empty bar. The juxtaposition of the beautiful exhausting day and the deluded man is a fitting end to this first set of Bottled Operas. I realize that I often wrap myself in so many contradictions that I forget the beauty that surrounds me. For an encore to the magnificant Olympic Mountains and Puget Sound, David and James perform Growing one more time; two monks walking on the shoreline. Read David's thoughts on the project posted the night before the premiere. In the company of my pooch I shadowed Emily Greenleaf and Stuart McLeod during their performance at Kubota Gardens. Ms. Greenleaf's crystal clear voice, refreshing as the cascading water falls, at times evoked images of ages old Chinese Opera. Mr. McLeod seduced a multitude of water drop voices to reach unaccustomed height and rhythm. A splendid surprise in this green Upper Rainier Beach haven.